Three decades after giving the world The Number of the Beast, Iron Maiden is poised to release its latest work — and it’s a beer. That’s the latest from the Metal Injection website, whose “Bands and Booze” section makes it uniquely qualified to present such news. 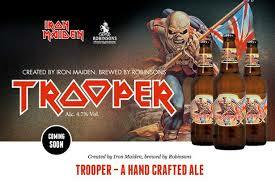 The band collaborated with Robinsons, an English brewery with roots in the 19th century, to create what lead singer Bruce Dickinson calls “our special secret-squirrel recipe for Trooper Ale.” Robinsons is also well-known for making ales such as Old Tom and Unicorn.